In this guide, we’ve hand picked our top 7 matched betting tips you can employ right now. Use these simple, essential strategies to maximise your matched betting profit in 2019 and beyond. If you’re already flirting with the idea of matched betting 2019, or you’re one of the many people currently using this great money making method to pay off student debts, pay for that dream holiday or just to have some extra money in the bank, these simple matched betting tips are for you. In this matched betting guide for beginners I’ll show you what matched betting is, how it works and of course our top match betting tips. For those of you who are new to match betting, here’s a little introduction. No risk matched betting or double betting as it’s also known, is a method used by thousands of bettors to profit from bookmakers’ free bets and promotions. As you may know, the betting industry is incredibly competitive. Therefore, the bookies offer countless incentives to grow and retain their client base. Using match betting, we can make a guaranteed profit from these offers. To do this we use a process called back and lay betting. In simple terms, this technique involves placing two opposite bets; one at a bookmaker and one at a betting exchange. This allows us to make our bets risk free and ensure we make a guaranteed profit. Check out this article for more information on what matched betting is and how it works. Without further a do, let’s jump into our expert match betting tips. Over the years, and after helping hundreds of people maximise their profit, we’ve worked out which matched betting tips are essential and which are merely all hype (and no profit). We could give you a huge list of 50 matched betting tips today – but do you really want to sift through all that information? It’s more than likely you’d lose track of which tips you had implemented in your matched betting strategy. Let’s have a look at each of these tips in more detail and work out how they can increase your matched betting success right now. Arguably the most important matched betting tip in our guide and the one that will significantly increase your profit is to summon the help of an expert. This is what we call assisted matched betting. No risk matched betting can be quite a challenging concept when you first start out and it’s important to get everything right as mistakes can be costly. But no need to worry, there are an increasing number of specialist matched betting sites out there that teach you everything you need to know about this technique. Some even walk you through the process hand in hand allowing you to learn matched betting very quickly. You can either use free sites or premium sites. Free sites provide a great base to start your matched betting journey, however, they usually have limited features and support staff available. You’ll also be limited in terms of what strategies you can learn and therefore the success you have. Looking to take your matched betting to the next level and extract every pound from bookmakers’ free bets? If so, you’ll want to use a premium matched betting site. Premium sites generally offer a more comprehensive matched betting solution – ultimately allowing you to make more money online. One of the key components to a successful matched betting site are the tutorials available. Premium sites typically spend more resources creating longer, more in-depth content. As well as in-depth written tutorials you’re also likely to find videos, infographics and images. All of which are created in the aim of making matched betting a simple process for beginners and more experienced bettors alike. Sometimes you just want to speak to those who are already up and running with a certain concept. Whether it’s an advanced matched betting strategy or a simple beginners question, you want an answer as quickly as possible. This is far easier with premium sites as most have forums built into their platforms. All premium members can ask and answer questions respectively. Didn’t quite get the answer to your matched betting question? Then contacting a matched betting expert is your next port of call. Again, this is made super easy with customer support. Some premium matched betting sites even offer a phone service as well as online chats and email. You’re likely to be capped in terms of potential earnings with free matched betting sites. This is generally down to a lack of coverage of more advanced matched betting strategies, techniques and methods. For example, free sites often leave out Casino and Bingo offers – an incredibly profitable and vital part of your matched betting strategy in 2019. Not sure which is the best matched betting strategy? Check out this article. If you’re anything like me, you’re always incredibly eager to get started with new things. I was exactly the same when I started matched betting. With premium match betting sites, the tutorials are generally designed to help you learn matched betting as quickly as possible. Typically, you’ll make a profit within the first day. Premium sites will have more features, including dedicated tools and software to help maximise your matched betting profit. Gone are the days where bettors would record all their bets and profit in a painstakingly created excel spreadsheet (no fun setting that bad boy up, let me tell you!). Nowadays, most premium matched betting sites have in built features to record all your matched betting information. Here at The Sure Bettor, we’ve built a feature called Tracking Plus, an all-in-one solution to keep all your match betting data in one place. This data is easy to visualise and understand through the use of graphs and progress bars. You know exactly how close you are to reaching your profit target. Overall, for those of you who are looking to maximise your matched betting profit, using specialist sites is an absolute must. I can’t emphasise the importance of this match betting tip enough. Another vitally important point in our matched betting tips – double checking everything has saved me from making countless errors when filling out an offer and missing out on that sweet profit. So of course, a keen eye is a must for matched betting success in 2019. Bookies don’t just give out free bets to anyone. There’s usually some type of qualifying criteria we must complete. Hey – no such thing as a free lunch. As any matched bettor will know, the bookies love to catch people out by using complicated betting jargon in the terms and conditions. Their main aim: to reduce the amount of free bets they have to give out. You’ll be glad to know this is set to change in the coming months. The Competition and Markets Authority (CMA) have concluded that bookies must stop misleading punters or else face penalties. Scanning through the terms and conditions for each offer is a manual and time consuming process. Check out the screenshot below of the Bet365 terms and conditions for their £100 sign up offer. As we mentioned above, scanning through all of this information takes a huge amount of time. That’s why here at The Sure Bettor we check all the terms and conditions for you, freeing up your time so you can complete more offers and increase your overall matched betting profit. We add all the required information you need to complete an offer to our members area. Everything is designed so you can make as much money as possible with the least amount of effort. Don’t place any bets until you’re sure everything is correct. And whilst we’re discussing bets; always place your back bet first. 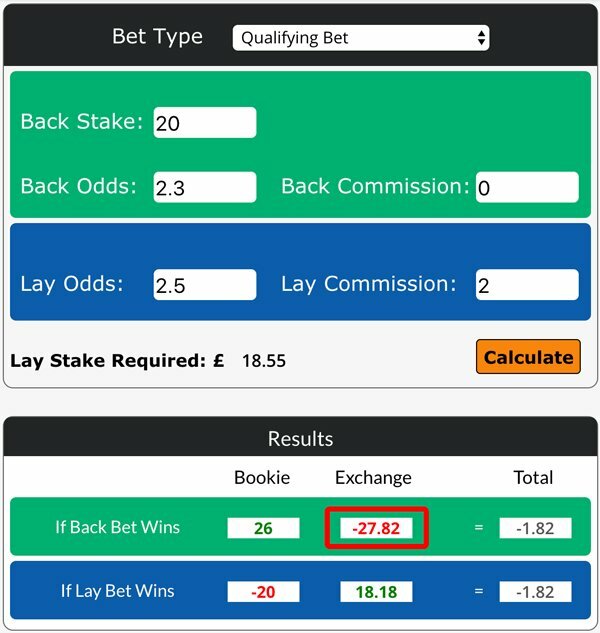 When you place your lay bets, check that the liability (the amount you stand to lose at the exchange) matches the figure the matched betting calculator worked out. I’m placing a £20 qualifying bet on Chelsea vs Tottenham. The back odds are 2.3 and the lay odds are 2.5. Note: I’m using the Smarkets betting exchange hence the 2% commission. I’ve highlighted the liability in the above screenshot (£27.82). Now we need to check this is the same at Smarkets. Click on the correct market and enter the lay stake, which is £18.55 in this example. You can see the liability is £27.83. Typically the two figures may be out by a few decimal points due to rounding differences – however, as long as they’re in the same vicinity it should be fine. Once your bets have been placed double check everything again. What if I don’t double check everything? The less you check, the more likely you are to make mistakes leading to less profit. The last thing you want is an unmatched or partially matched bet. These leave your matched bets in a precarious position and can sometimes lead to unnecessary, costly mistakes. As with anything, human error is inevitable at some point but the aim is to avoid as many mistakes as possible. Next up in our matched betting guide, is one of my personal favourite tips for match betting and one that directly affects the amount of profit you make. For most markets, we suggest you use Smarkets over Betfair. There’s some industry debate as to which is the best betting exchange to use for your matched betting. Needless to say, different matched betting sites have their own preferences. However, here at The Sure Bettor, we recommend you use Smarkets for the reasons outlined below. In terms of your actual matched betting, commission is one of the most important factors that directly affects your profitability. As I touched on at the start of this article, to make matched betting risk free we place two bets for each offer we complete – one back bet and one lay bet. Each bet effectively cancels the other out. We use a betting exchange to place our lay bets. Betting exchanges make money by charging a commission on players’ net winnings. There is no avoiding this and it’s a necessary evil. The aim is to minimise the amount of commission you pay so you keep more of the profit for yourself. So how does commission affect your matched betting profit? Over a longer period, a lower commission rate of 2% makes a significant difference to your matched betting success. Let’s say you’re making £1000 each month and hypothetically you’re winning half of that at the betting exchange. After a year’s worth of winning £500 each month at the exchange, you would have made an extra £180 in profit just by using Smarkets over Betfair. It’s well worth considering this when you pick where to place your lay bets. On more than one occasion, Betfair have reduced their commission rate to just 2% knowing they’re taking a vital USP (unique selling point) away from Smarkets. However, it’s always been more of a short term marketing ploy than a long term strategic decision. Smarkets openly welcome any kind of bettor. Whether that’s a trader, a regular gambler or a matched bettor, they’re happy for you to bet at their exchange. In my mind, that makes complete business sense. The more people they open their platform to, the more commission they can potentially make. Head to their website and their mission is plain and simple for everyone to see. Their aim is to make the betting industry more transparent. Check out this Smarkets ad within the Google search results. They even advertise the availability of matched betting on their site. Just goes to show how open they are to any kind of betting. Compare this to Betfair and you can see two very different companies. PaddyPower Betfair are a more traditional bookie with less emphasis on trading. Their target market is those looking to place regular bets online. This is obvious when you look at Betfair’s Sportsbook. I can’t see Smarkets ever owning a sportsbook platform! Ironically I was wrong… In November 2018, Smarkets started building their own sportsbook! Despite the chances still being low, you’re more likely to get your Betfair exchange account restricted or gubbed than your Smarkets account. I’m not taking anything away from Betfair. They’re a brilliant company and there are times when I suggest you use them over Smarkets. For example, when you’re placing matched bets on more obscure markets – less popular markets with lower betting activity. Due to their size and age, Betfair are the go-to for such markets. They have far greater liquidity (amount of money waiting to be matched) than their competitors. For beginners out there, this means placing your matched bets is far easier. You can find out more about different betting exchanges here. Another gem in our match betting tips and one that directly affects the amount of profit you make (and something we’ve touched on in previous tips) – picking markets with similar odds. Matched betting involves placing two bets at different betting companies. We place one bet at a bookie and one bet at a betting exchange. Matched betting is all about finding close matches between two markets. The aim is to look for markets with tight back and lay odds. The closer the match, the more money you’ll make from an offer. This refers to both qualifying and free bets. Let’s say you’ve found a market to place your qualifying bet. The back odds at the bookmaker are 3.5. In this scenario we’d want the lay odds at the betting exchange to be something like 3.7. The closer these two figures are, the less money you’ll lose from this qualifying bet. It’s that simple. Read this article for more information on how matched betting works. Next on our matched betting tips list is using multiple bookies. In today’s world of ultra competitive online gambling, each bookmaker offers countless promotions to incentivise new and existing customers to place bets with them. Using no risk matched betting, we can extract a great deal of profit from these offers on a daily basis. Typically, we aim to withdraw at least 80% of a free bet in cash. Needless to say, the more offers you complete, the more profit you can make. That means registering with as many bookmakers as possible. There are hundreds out there to pick from, so there’s plenty of choice. It’s important you find out as much information as you can before signing up and depositing your funds. Unfortunately, there are hundreds of illegal betting companies out there trying to catch out careless punters. A quick Google search with the name of the betting company followed by ‘reviews’ is a great place to start before you part with any cash. Make sure you check out more than one search result. These days, a lot of websites create fake reviews to entice people to sign up through an affiliate link. Using a trusted matched betting site or assisted matched betting service is another great way to ensure you don’t get caught out. These services will list all the legitimate bookmakers and their respective offers. You’ll also have access to in depth tutorials on how to complete each promotion offered by the bookmaker (with all the qualifying criteria clearly laid out) . At The Sure Bettor we provide all of this information – what’s more, it’s updated on a daily basis to include the latest matched betting offers so you never miss a chance to profit. Limited time for matched betting? If time is tight and you’re struggling to fit in your matched betting, you’ll want to focus on certain bookies that typically provide the greatest return. If you focus on some or all of the sportsbooks below, you’ll be in safe hands. These bookies generally provide the most rewarding and profitable offers. Number 6 of our matched betting tips is to keep your bookmaker accounts open and active for as long as possible. The longer you keep your accounts unrestricted, the more success you have and the more profit you can make. The bookies know about matched betting and it’s fair to say they’re not all big fans of the technique. If your betting patterns are too obvious, your accounts will likely be restricted in some way. We call this gubbing. It can be anything from a stake restriction to a complete account ban. As you can imagine, neither are beneficial for matched betting. Bookies don’t like customers who just continually take advantage of their free bets and promotions. This is why you need to place mug bets on a regular basis. We see a lot of people start matched betting and within a few months their accounts are gubbed in some way. They’ve made a profit from all the offers in that time but they’ve also ruined their chances of long term profitability. 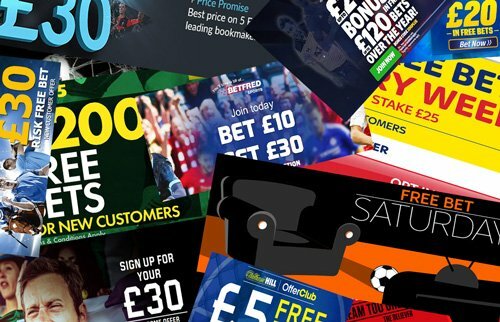 Bookies use sophisticated techniques and tools to study users betting patterns, particularly when there are promotions available. We can combat this by placing mug bets. Mug betting is the process of placing bets which do NOT qualify for a free bet or promotion. These bets are designed to hide our matched bets and keep our bookie accounts open. Note: You will lose a small amount of money placing mug bets – they’re essentially a qualifying bet. Are mug bets still effective in 2019? Recently, there seems to be some negative press around mug betting. I was chatting to some bettors on a Facebook group the other day specifically about the use of mug bets. It’s fair to say that we weren’t in agreement. Comments like ‘mug betting is dead‘, ‘it takes a lot of time‘ and ‘you lose money placing mug bets’ we’re liberally thrown about… you get the picture. Here at The Sure Bettor, we are firm believers in mug betting and would say that it is still a vital part of a successful matched betting strategy in 2019. There’s no denying it, mug betting takes time. But just because it takes time, that shouldn’t mean we avoid using this technique. If it increases the profitability and long term success of matched betting, it’s a no brainer. However, mug bets aren’t the only tool we can use to ensure that we don’t lose our betting accounts. You’ll need to use other methods too – find out more in our dedicated gubbing article. I suggest you place one mug bet for every matched bet you place. This may seem like a lot, but as we’ve discussed, it’s vital for long term matched betting success. Last but not least, our final matched betting tip is never turn to gambling. This is an incredibly important tip and one that all serious matched bettors should stick to. If you turn to gambling, you’ll likely waste all of your hard earned matched betting profit in a matter of weeks. If you’re looking to gamble your money in the aim of winning big, matched betting is not for you. However, if you’re looking to follow a proven strategy in order to make a guaranteed profit online, match betting is right up your street. Room for a few more matched betting tips? What’s a complete matched betting guide without a few bonus tips? If you’re new to matched betting, the whole concept may seem a little confusing when you first start out. Not to worry, everyone’s got to start somewhere. And we recommend you start off with the sign up offers. These are the easiest and most profitable matched betting offers to complete and they also allow you to build up your bank balance. The larger your bank balance, the more offers you can complete at the same time ultimately allowing you to make more money. You may want to dive straight into other matched betting offers like price boosts and extra place offers. However, we recommend you nail the easy sign up offers and work from there. You’ll find all the sign up offers in the members area of our site. We show you the exact process required to profit from each offer with easy to follow tutorials. Another one of my favourite matched betting tips today is to remain persistent. This tip specifically applies to matched betting in 2019. The hype around match betting continues to grow and with that comes skepticism and critics. Some individuals question is matched betting worth it in 2019? But as with anything, you’ll need to keep working hard. The profit doesn’t just end up in your bank account. Just like anything, be persistent and continually work at learning new matched betting strategies etc. The serious matched bettors, who earn significantly more than the part timers, work hard at finding new and exiting promotions to take advantage of. Assisted matched betting is not essential. However, if you’re looking to extract as much profit as possible then you’ll certainly want to consider this strategy in 2019. Double checking everything is one of the most important matched betting tips on this list. This will help you avoid any stupid, costly mistakes. I recommend you use Smarkets as your preferred betting exchange, mainly due to their industry-leading commission rate of just 2% and their incredibly open philosophy. I’ll leave the ultimate decision with you though. Picking markets with similar back and lay odds is a key part to extracting as much profit as possible from each offer. Furthermore, this matched betting tip is incredibly easy to implement especially if you’re a beginner. The more bookies you sign up to, the more offers you can complete and the more profit you make. Simple as that. Despite the negative thoughts around mug betting, I still think these bets are crucial to a successful to a long-term matched betting strategy in 2019. Never turn to gambling as you will lose money. 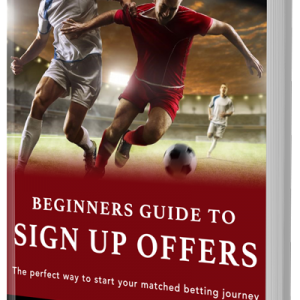 Starting your matched betting journey with the easiest sign up offers is a well recommended strategy. Keep working hard and continually look for new and exciting ways to profit from match betting. That’s it for today’s matched betting tips guide – stay tuned to the blog for future tips, updates and techniques. Until next time – good luck with using these tips to increase your matched betting success. Which is your favourite matched betting tip? Let me know by leaving a comment below right now. You say to put on a ‘mug’ bet for every matched bet. Talk about defeating the object of match betting altogether. Then two sentences later you tell us not to gamble which is exactly what ‘mug’ betting is! I think you should have a quiet word with yourself. Shockingly bad advice for newcomers. Thanks for the comment. Perhaps this is a misinterpretation between the ‘technique and method of match betting’ and ‘gambling’ per se. Mug betting is an absolute necessity if you want to make money long term with matched betting. It’s proven by the success of career matched bettors. I hope that clarifies my comments in the article.